The latest release from ‘former’ Kiss lead guitarist Bruce Kulick …Yeah, I know bit of a stigma there I suppose, as Ace Frehley was the main man there, then Vinnie Vincent, then Bruce …, but since then when Ace didn’t play a part there has also been Mark St. John (RIP) and most recently after Ace’s last departure, Tommy Thayler. Before joining Kiss though Kulick had made his name rocking on Meatloaf’s Bat Out Of Hell tour from 1977 / 78, being in a band called Blackjack which also featured a certain Michael Bolton during his rock years before joining Kiss from 1984 – 1996 until Frehley rejoined the glam kings. Since Kiss he’s been with Union alongside John Corabi (Ex-Motley Crue) and touring with Grand Funk Railroad since 2001. He’s also done a reasonable amount of session work for various people, so the man's got history! First off though on BK3, I am at a certain disadvantage as I have not heard either of his previous 2 solo outings, but with BK3 he’s acquired some assistance from members of Kiss (Gene Simmons and Eric Singer. ), The Knack (Doug Fieger), ex-Motley Crue vocalist John Corabi (Who was also with Kulick in Union), other guitar genius in Steve Lukather and Tobias Sammet from metal act Edguy. When I first played this album, I will concede that I didn’t give it fair listening and gave up halfway through but that said now I can’t stop playing it! So understand that it is a grower, not instant at least not for me. With the various vocalists onboard plus Kulick himself, it didn’t flow for me initially and there was something else that I couldn’t pin down, but now I guess the best description I can give is that this has a raw, energetic not specifically polished sound as it starts, but then it adds more variety as it goes on. Opening track “Fate” kicks in with a pummeling of the drums and just never eases up and Kulick handles the vocals himself here. Actually he doesn’t sound far from Ace Frehleys style, but this track has really grown on me and the solo is put simply, sweet! Great opener. Kulick brings in former employer Gene Simmons for the lead vocal on “I Ain’t Gonna Die,” which as opens again as a raw rocker before hitting big harmony vocals ala say Van Halen in the chorus build up, then the song goes into an almost Beatles sounding string section and again on first playing of this, it didn’t grab me but like the rest of this album it’s really grown. Former Union singer / band mate John Corabi steps in next for “No Friend Of Mine” and when the song started, I had recollections of early Alice Cooper for some reason, but that soon passed once the first verse kicked in. There’s a certain darkness about the track which goes along with the whole album, but the musicianship here is great! Again, great guitar work from maestro Kulick. Very strong song. “Hand of the King” has an eeriness to it and features Nick Simmons son of the Kiss mainman Gene and on first listen to this track, I could not get into it but now this seems immense retaining that dark and heavy edginess about it, but again it fits to work well on BK3. Kulick takes control of vocals again for “I’ll Survive,” which almost has a Pink Floyd / Soundgarden type psychedelic vibe to it, which seems a little odd in the album make up, but it just takes things down a little and plays out well. OK, next track “Dirty Girl,” has to be my absolute favourite here, it is so hook laden and is certainly the most commercial sounding track here and also features the vocal talents of Knack frontman Doug Fieger … This certainly could be a hit if it got the airplay. Love it! OK, now“Final Mile” for me with the intro gives more than a nod towards perhaps a certain Mott the Hoople track or even a certain cover track Kiss did a few years back now. Another easier going track away from the rawer, edginess of the opening salvo of songs. Great solo work again. “I’m The Animal” features Kiss drummer Eric Singer and German metal band Edguy’s frontman Tobias Sammet and the track has Kulick riffing all over the place, as well as those huge big choral backing vocals again, almost Def Leppard like. It’s heavy yet catchy, works well. More contagious chorus vocal hooklines and big vocals in “And I Know” next with Kulick stepping up to the mic again. 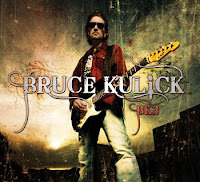 For “Between The Lines,” Kulick has pulled in fellow guitar genius Steve Lukather for the albums solitary instrumental and while you might think there’s no chorus or familiar vocal line to sing along with, the guitar harmonies grab you in such a way that you’ll be loving this. Nice work. Album closer “Life” is apparently a small tribute towards Kulick longtime idol George Harrison (RIP), I actually felt it was a little (Bob) Dylan’ish myself, perhaps with a hint of Beatles but from the powerful trip that the rest of the album took, this is a soulful closing piece, with just a hint of sub-flamenco at the very end of the track. Throughout the album, Kulick’s work on guitar is excellent, stunning and his vocal work fits too and even with a variety of players / vocalists, this is an album certainly for Kiss collectors, but also anyone that appreciates a good balance of rock music from hard rocking to some commercial edge too. For me, well worth checking out. Rating: 4 of out 5.